The Yorkshire Integrated Catchment Solutions Programme (iCASP) is an ambitious and exciting call to action: a research translation programme to deliver benefits worth more than £50M to the regional economy. Projects supported by the programme are co-created by researchers and partners from a range of different organisations active in the Ouse basin, using existing science funded by the UK Natural Environment Research Council (NERC). Advance understanding of dynamics and interactions in river catchments, including peatlands, upland land cover and management, rivers, waterways, water quality, and sustainable agriculture. Steep upland areas of the catchment make forecasting floods challenging. The programme will be promoting an approach to problem-solving that involves joined-up thinking and planning across all aspects of river catchment systems, from upland areas through urban areas to lowland agriculture. Such a holistic approach is rarely attempted, but the design of the iCASP programme will hold true to the principle of integration. It will enable a range of stakeholders to tackle catchment-wide issues using the latest innovative catchment-relevant science. iCASP is therefore a novel programme that will see scientists, local government, businesses, and charities work together to make a difference to planning, policy and practice across a wide range of sectors that need to understand catchment dynamics. Peatland restoration, and upland land cover and management, such as on Ilkley Moor, are part of an integrated catchment approach. To improve climate resilience in the region’s cities through the policies and investment strategies of local authorities, and major infrastructure owners. To enhance carbon storage in soils and woodlands. What area does iCASP cover? 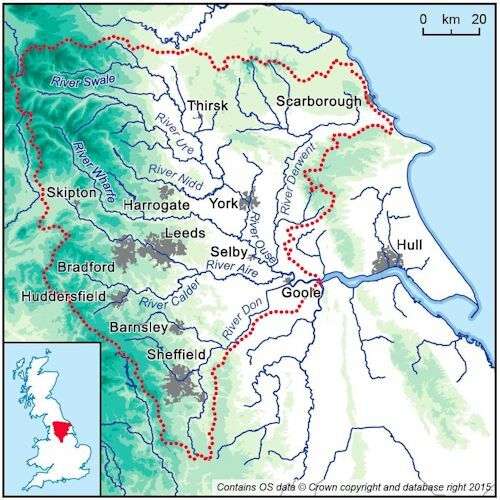 iCASP will focus on the Yorkshire Ouse catchment, which is home to 6.7% of UK population, 30% of the Northern Powerhouse region, covers a third of the land area of Northern England, and includes 10 Metropolitan Boroughs. In the future, we expect to export the philosophy and structure of this programme to other catchments in the UK and internationally. iCASP has four academic partners: the Universities of Leeds, Sheffield and York, and the National Centre for Atmospheric Science, and sixteen key springboard partners from across the region: UK Met Office, Environment Agency, Natural England, City of Bradford Metropolitan District Council, Leeds City Council, York City Council, Leeds City Region LEP, Yorkshire Water, Arup, JBA Consulting, National Farmers Union, Dales to Vales Rivers Network, IUCN UK Peatland Programme, Yorkshire Wildlife Trust, Pennine Prospects, LEAF (Linking Environment And Farming).